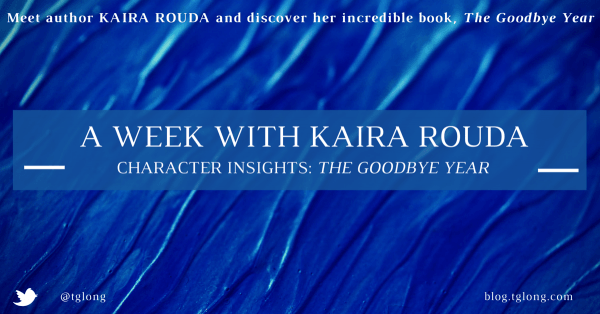 The ‘A Week with Kaira Rouda’ feature includes a two part interview (click here for part one and here for part two), an excerpt from the novel, character insights, plus some quick quotes. There is also a $25 Amazon gift card giveaway, which you can enter below. 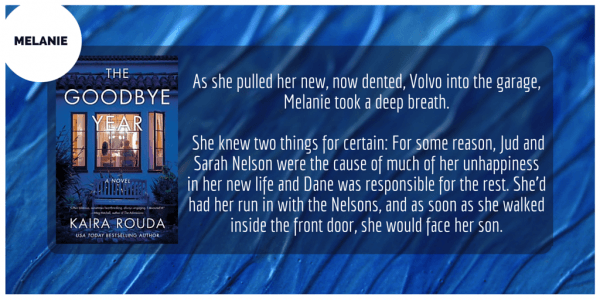 As she pulled her new, now dented, Volvo into the garage, Melanie took a deep breath. 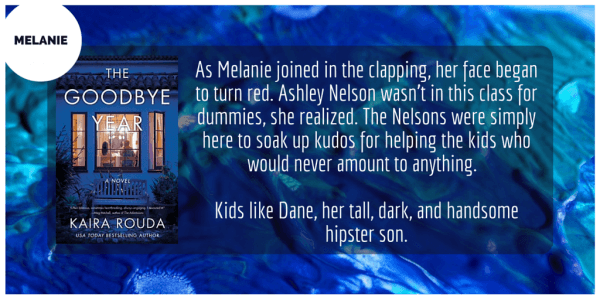 She knew two things for certain: For some reason, Jud and Sarah Nelson were the cause of much of her unhappiness in her new life and Dane was responsible for the rest. She’d had her run in with the Nelsons, and as soon as she walked inside the front door, she would face her son. He would be ready, expecting a fight over comments his teachers had made to her. It had happened every year at Parents’ Night beginning in the fifth grade, in Ohio and in California. Melanie sitting eagerly with the other parents, hopeful the start of the new school year would result in a newly dedicated, studious son. Dane would become the A student, not the slacker and class clown. And then the science teacher would pull her aside and tell her he talks too much. Or the history teacher would say, “Oh, you’re Dane’s mother. What a handful, that one,” or some other comment that would let Melanie know she’d failed as a parent and Dane would be, most likely, failing the class. From that inauspicious start would follow meetings with the principal, dropped classes, detentions, and the rest. Just another year. But this was the last year. Senior year. This was his last chance. Her last chance. She knew already they’d blow it. She knew it the moment the taillights shot into view in front of her, the moment she realized she didn’t have time to stop as the sickening crunch filled the otherwise quiet and dark, foggy night. 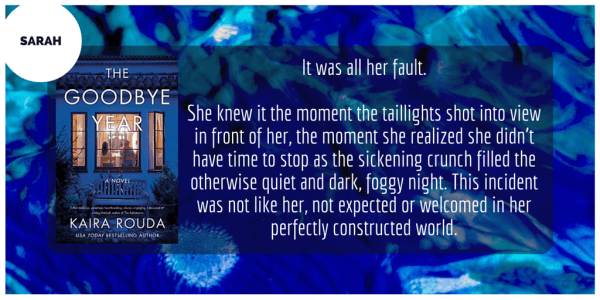 This incident was not like her, not expected or welcomed in her perfectly constructed world. 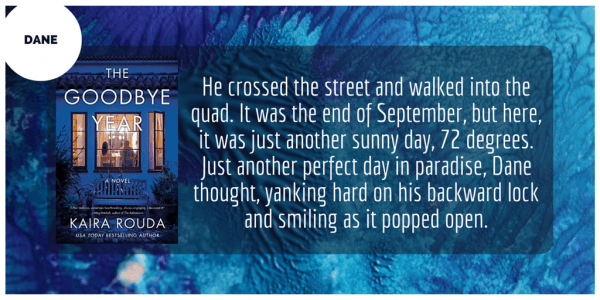 She’d been on edge all evening, going through the motions during what would be her last Parents’ Night. 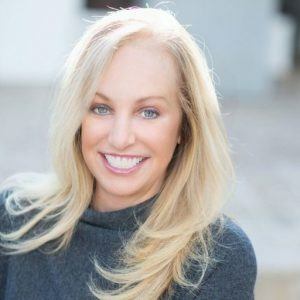 She was uncomfortable sitting down, a problem when you’re stuck wedging yourself into a teenage-sized plastic seat in classroom after classroom, scanning the desktops before she left each one, making sure to brush off any stray hairs she’d left behind. She’d been losing hair for weeks now, long blonde strands flinging themselves off her head. Her friends all told her she looked thin. She’d always been thin, and she knew she needed to eat, but nothing tasted good to her these days. The stupid second breast enhancement Jud had insisted on made her look even thinner, she realized, the juxtaposition between her chest and her waist too fake, too scary. So she wore bulky sweaters whenever possible, and layers, lots of layers. 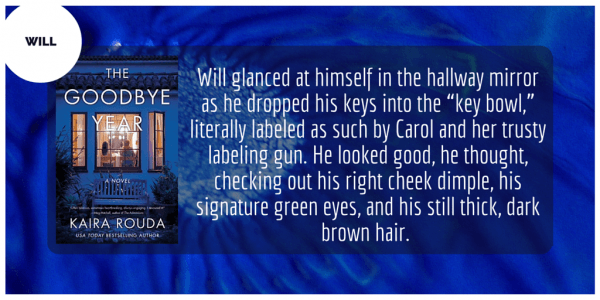 Will glanced at himself in the hallway mirror as he dropped his keys into the “key bowl,” literally labeled as such by Carol and her trusty labeling gun. He looked good, he thought, checking out his right cheek dimple, his signature green eyes, and his still thick, dark brown hair. Noticing a lipstick mark on his neck, he used a finger to rub it away. He flexed, proud of his biceps, his body lean and muscular thanks to hours at the gym and his penchant for riding his bicycle whenever and wherever possible. As long as Carol granted him permission, of course. Jud zipped the suitcase closed and took time to look at himself in the mirror. He’d need Botox soon, he realized, frowning and examining the lines between his eyebrows. They were returning and he couldn’t have that. He liked speaking around the world, and he knew part of his appeal, besides his expertise on the patent-covered surgical procedure he’d invented, was his appearance. He flexed his bicep and watched it bulge under the fabric of his white dress shirt. He opened his iPhone and called Tom, his assistant. 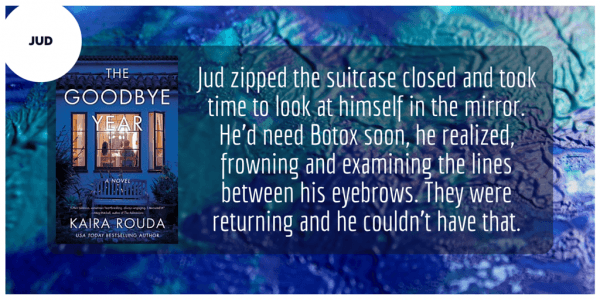 The man was a late sleeper, Jud knew, shaking his head as the call rolled to voicemail. Even though he’d see him later, he left a message asking him to block out a half hour in his schedule after the trip. He crossed the street and walked into the quad. It was the end of September, but here, it was just another sunny day, 72 degrees. Just another perfect day in paradise, Dane thought, yanking hard on his backward lock and smiling as it popped open. As a senior, he was past all of the overt bullying of the first two years in this idyllic town. “Everybody wants to live here,” his mom would tell him as he forced himself to endure another day of hell freshman and sophomore year. The only thing that made his time at school bearable had been Seth. And now, it was senior year. 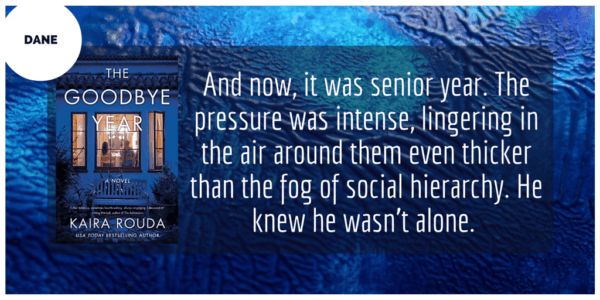 The pressure was intense, lingering in the air around them even thicker than the fog of social hierarchy. He knew he wasn’t alone. They were all expected to finish strong, to use this first semester of senior year to get into a college worthy of graduates of Crystal Beach High School and the offspring of the titans of Crystal Beach. My thanks again to Kaira for sharing such wonderful insights into her writing, her work, and the characters within!